1. What’s in the package? A fleet of bikes is made up of a range of different children’s bikes. It is recommended that good quality bikes are purchased and that there is good local support for ongoing servicing of the bikes. It is also recommended that the school identify one or more people in the school or local community to be taught how to service bikes and then continue to service them on a regular basis (see Bike Maintenance section). The largest bike can also be used by the teachers. It is recommended that step-through bikes are used as these are the easiest and safest bikes for riders to get on and off. It is recommended that each bike is individually numbered by the school (e.g. 1 to 50) so that the students can quickly identify the correct bike (size) for them to ride. A typically recommended fleet of 50 bikes for a school consists of the below but can vary depending on the make-up of the school roll. E.g. year 1 to year 6 or year 1 to year 8? The fleet makeup for intermediate schools is likely to require a smaller range of sizes than for a primary school. A mix of 24 inch and small adult bikes should be sufficient but consult a local bike supplier or bike expert for advice. Also getting 2 or 3 x little balance bikes for very small students is strongly recommended. You can see some examples of this Bikes in pre-Schools video. The cost of a full range of sizes to make up an average bike fleet is approx. $10,000 to $15,000 + GST. Prices can vary depending on the supplier, brand, bike specifications, and assembly and delivery costs. Also, check with your supplier whether they include a six-week service check (free or at cost). Schools need to record the unique identification number of each bike and also add the bikes and helmets to their overall school insurance policy. Most schools record their bikes and helmets under sports equipment. Bikes in Schools is all about regular and equal access to a bike at school every child. For students with physical disabilities, this has been made possible thanks to the Halberg Disability Sport Foundation who have generously provided special purpose bikes for students at some different schools we have been working with. The Halberg Disability Sport Foundation’s vision is to help build a society in which all New Zealanders have equal opportunity to participate in sport and recreation – with No Exceptions. The Foundation’s mission is to enhance the lives of physically disabled New Zealanders by enabling them to participate in sport and recreation. Some suppliers include in their quote assembly of the bike fleet. Please check with your supplier if this service is provided as part of the fleet cost. It is recommended that the individual bike serial number for every bike is recorded and stored by the school as part of the asset register. These can be used to identify bikes if they go missing. Some suppliers can provide an asset sticker system for a fee, to help manage the fleet. It is recommended that a good quality helmet is available for every child in the school so that there is no need to share helmets. It is best at the start of the project to fit and name (e.g. Sam W) individual helmets (on the side) for each child. Most schools store the helmets in their classrooms, so they are easily available for when the class goes biking. Graduating students usually hand their helmets back in so they are available for new students. Over time as the students’ heads get bigger, some may need to be issued with bigger helmets. Some schools opt for a shared set of helmets, e.g., 100 of mixed sizes. These are kept in the bike shed or shipping container along with the fleet of bikes. There are many different brands of helmets available. It is recommended that helmets comply with AS/NZS 2063 helmet standards – check for the official sticker. We also recommend helmets that have easy to adjust straps. We recommend that if possible different sizes are provided in the same colour to make it easier to identify which bike a student should be using, i.e., all the balance bikes are blue, all the 18” bikes are red, all the 20” bikes are green. Check with your supplier whether they can do this. There are many bike suppliers across New Zealand. We recommend buying high-quality children’s bikes and helmets to reduce future maintenance requirements. The following two companies both supply nationwide and have a good record supplying schools across New Zealand with bike fleets. We strongly recommend all schools to also get additional quotes from local bike shops and other suppliers, including costings for an ongoing maintenance plan and regular fleet servicing. It is essential that the bikes are stored in a safe and secure (and alarmed if possible) building within the school grounds. It is recommended that this storage is as close to the bike tracks as possible to allow easy access. The recent significant decrease in cost for remote (internet) security cameras means that this is now a much more affordable option for school. Some schools can store the bikes in an available shed or an unused classroom. A school may decide to build a purpose-built shed or use a general sports storage shed that includes all their sports equipment. The majority of schools have opted for a specially converted 40-foot shipping container. This usually does not require a building permit as it is not a permanent structure but please do check with your local council. Also, it can be moved around if required. The container needs to have a flat floor not a steel/metal ribbed floor. It’s recommended that two doors be added to one side of the shipping container to make it easy to access the bikes. There are three main door options: roller, hinged or sliding. Hinged doors provide better security than roller doors and should be cheaper to supply than sliding doors options. Some schools have used 20′ shipping containers for smaller bike fleets or where there may be site challenges for larger containers. Some schools have added lighting and power outlets, and connections to existing school alarm systems where the container can be sited near an existing school building. There are also wireless alarm systems available. The welded padlock protective box used with hinged and sliding door fittings can be used with closed shackle padlocks or standard padlocks. These provide extra protection for the padlock shackle. It is recommended that the container is kept slightly off the ground if being situated on the grass by placing railway sleepers underneath. This will allow air to circulate. Some schools have installed a concrete pad for the container to sit on, as well as a concrete pad in front of the container for the bikes to be parked on during the day. It is good to add a concrete or asphalt ramp up to the lip of the doors so to make it easier to get the bikes in and out of the container. If you do go with a converted 40-foot shipping container, please ensure that there is sufficient access for the container truck to get onto the school grounds and into the correct area. The truck that delivers the container is usually 18m in length, so this needs to be taken into account, and the truck has to be able to park parallel to where the container will be placed. If in doubt it is recommended to ask the trucking company to do a pre-delivery site visit to your school to check that the access for the truck is possible. You need to think about putting the container in a place where the bikes are relatively close to the bike tracks. Please note some schools go for the High Cube 40 Foot Shipping container as it is more spacious inside. Basically the ground footprint is 12.20m x 2.44m. The cost of a fully converted and painted 40-foot shipping container with two doors is approx. $8,000 to $9,000 + GST. Prices can vary depending on the location of the school. We recommend Forrest Green as the standard colour as it blends in with the natural environment, but it is possible to get other colours to match with the school buildings. Ask your supplier for a colour chart. To increase security, some schools have added a simple security gate that fits over the front of their roller doors to increase security. These are very effective. Many schools install some system for organising the bike fleet and helmet storage inside the container. There are many options available, and it comes down to budget. There are many suppliers across New Zealand that sell new or used converted shipping containers. The following two companies have supplied schools with specially converted containers for their Bikes in Schools projects and both can supply nationwide. Contact them for a quote for your project. We strongly encourage schools to also get additional quotes from other local suppliers. It is recommended that for students to achieve the maximum benefit from the project that if possible, the school constructs all three bike tracks, Riding, Pump and Skills. Due to land or funding constraints, some schools have decided to construct only one or two of the three tracks. This track usually follows the very outer edge of the schools playing fields so as not to interfere with the established rugby and soccer fields etc. Some schools have designed tracks that go part way around the fields and then double back and return parallel to the starting point. The riding track is where the greatest amount of riding (distance and time) is usually done. It is possible for large numbers (50+) of children to ride at any one time, see here. Many schools use the main riding track for not just biking but also walking and running, and schools with swimming pools also use it to run their school triathlons. See more Riding Track – Limestone or similar construction details: Limesand Track Construction. While to date most riding tracks have been built from limestone or similar some schools have recently put in asphalt or hot mix riding tracks. While asphalt tracks usually cost more than limestone they require much less maintenance and can be used by scooters and are an excellent all-weather option to consider. This is very similar to a small BMX track. If done correctly the children do not pedal but actually “pump” their bikes up and down the slopes to get around the track. It is similar to the movement used to operate a child’s swing. This track “burns” the most calories. This track is usually the most popular with children as for many it is “the most fun” of the three tracks. It is recommended that no more than six students ride this track at any one time. Ensure the pump track designers and builders are in conversation with the bike provider to ensure the track is designed to suit the children sizes bikes you will purchase. Different bikes have different centres of gravity. It is recommended that you have a child’s bike available on site while you are building. A small number of schools have built asphalt pump tracks, see here. This is made up of a limestone track that takes the rider over a series of obstacles. This track is often the most challenging as it requires the rider to concentrate and ride very slowly. It is particularly good for improving hand-eye coordination. This see-saw is the most difficult and popular obstacle for the children. It is recommended that no more than six students ride this track at any one time. A few schools have gone for asphalt as this reduces ongoing maintenance needed. See our very detailed guide: How to build a Skills Track. It is strongly recommended to have intro cycle skills training provided on-site for all students from the first day the track opens. These trainers might also be able to help oversee the fitting of the helmets, help children select the correct size bike to ride, explain to teachers and students how to ride the different track, teach basic bike riding skills, as well as introducing some bike exercises and games for the students. We recommend that schools make contact with their local cycle skill providers (usually local council, Regional Sports Trust or Police) in advance to have this training booked from the start. 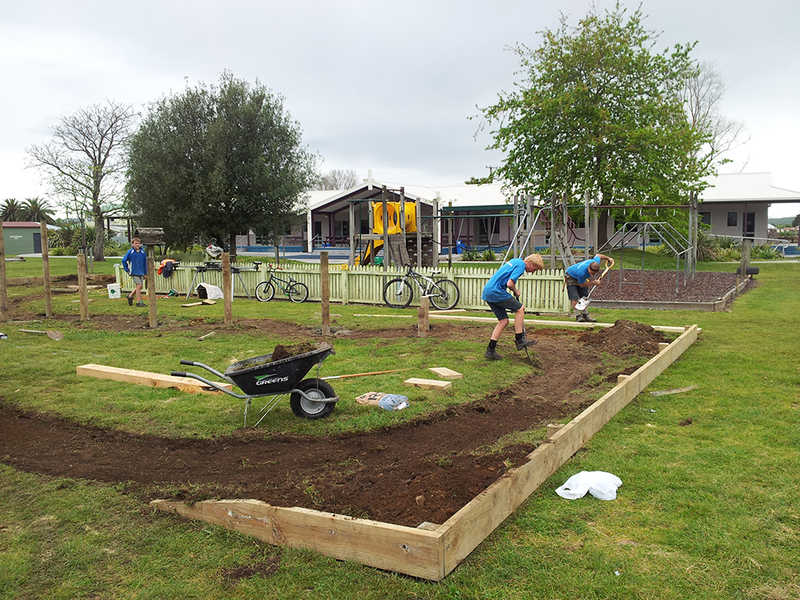 In Auckland, Auckland Transport fund Cycle Skills Training at all the Auckland Bikes in Schools projects. 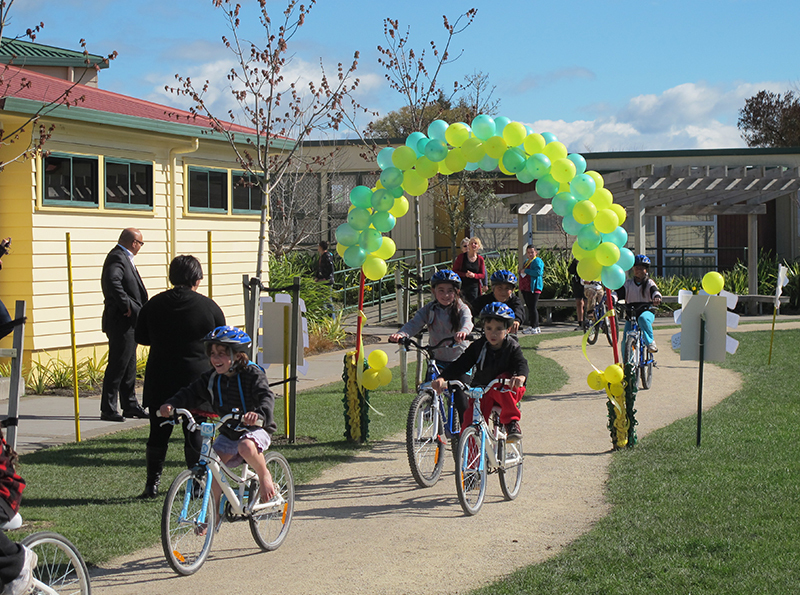 Many regional or local councils such as Wellington, Palmerston North and Christchurch support their local Bikes in Schools projects with cycle skills training for students and staff. What are the approx costs for an average school of 300 students? Ongoing annual bike and track maintenance costs are approx. $3,000pa. We strongly recommend that all schools allocate this funding in their operational budget, so it’s available when required. Costs may be lower for schools with smaller rolls. Some costs can vary by region. While the costs for bikes and helmets are standard throughout the country, track building costs can vary greatly between cities and even construction companies within an area. It is best to get as many quotes as possible. The cost of the material (usually limestone or soft metal) used for the main riding track can also vary greatly by region. Having the track construction work done “in kind” or “at cost” by local companies. This has the potential to generate the biggest savings for a school. Having the track material (e.g. limestone) provided “in kind” or “at cost” by a local supplier. This also has the potential to generate the major savings for a school. We strongly recommend that schools get multiple (3) quotes for each item (bikes, tracks, containers etc.) to ensure they are getting the best value for their school. We also recommend that schools talk to other nearby schools that have already implemented Bikes in Schools in their area to get feedback and recommendations from the suppliers and contractors that they used. It is also a great opportunity to see the project in action and get some general advice from those schools. See here for a map of Bikes in Schools locations. Who are the possible funders and support providers for the project? Funding for all the schools’ projects so far has come from a diverse range of funders. It is recommended that if possible, the school wait until all or most of the required funding has been gained before beginning to build the tracks. This makes things easier in general and may mean that the different contractors can work on-site and utilise each other’s equipment. Some local contractors may be able to offer some services or product in kind. In some cases the MoE also allows schools to use their property budget (5YP) towards the cost of building tracks. Please see this press release for more details. The NZ Government press release. We recommend all schools formally confirm BOT approval before beginning the fundraising and implementing of their Bikes in Schools project. Most funders will require confirmation of BOT support (letter) for the project as well as a minuted resolution about where who and how much is being applied for to be included in the actual funding application. We also recommend that all schools formally allocate $3,000 pa from their operational budget for the maintenance of the bikes and tracks and that they show this to potential funders when doing grant applications. spraying will be required around the outside edges of the riding track. light top up once a year. be to have an annual bike track school working-bee or get back the company that built the track. To ensure that your fleet of bikes stays well maintained and safe, we strongly recommend that your school follows this simple bike maintenance schedule: Bike Maintenance Schedule. This BikeWise Safety Check is also very useful: BikeWise Seven Point Safety Check. The bikes will require regular checking to ensure the tyres are pumped up and that the chains are oiled. Some schools have student ‘bike monitors’ who are selected students that take care of these tasks on a regular basis. Other schools arrange for some parents (or grandparents) to come to the school to do these tasks. It is recommended that the school establishes a relationship with a local bike shop for them to come in and thoroughly check the bikes at least once a year and to complete mechanical repairs as required. This Bike Shed Manual provides detailed information to helps the school with the maintenance of their Bikes in Schools bike fleets. It is recommended that schools put up some Bike Tips signage that provides some basic safety messages and information for all users. Please see here for some examples from Wellington City Council and Palmerston North City Council. Most schools launch their Bikes in Schools project with an official opening. Usually, it involves special guests such as the local Mayor, MP or a famous sportsperson to open it. Parents and the local community as well as local media (and sometimes national) are also always invited. Each school puts their style onto the event. Some schools put out a simple press release about the event and detailing the different funders. The opening is also used by schools to publicly thank the funders and supporters who have helped make the project a reality. The opening event at every school so far has also lead to very positive press coverage and publicity for each school. Often the schools have an acknowledgement / thank you sign put up to publicly thank all funders for their contribution to their Bikes in Schools project. Please see our media page for examples of media coverage of opening events. BikeReady is New Zealand’s national cycling education system. It provides age and skill level appropriate cycle skills training (to schools) which is delivered by professional instructors contracted to a school’s local council or other local providers. Please note that there is no charge to schools for BikeReady cycle skills training. It is important to ensure that helmets are fitted correctly and bikes are in good condition. 3. Lastly, put one finger under the strap beneath your chin. This should also be firm. If you or your friends have a crash you need to tell an adult, especially if you bang your head – just in case you need to see a doctor. Check your bike every time you go for a ride, but especially if you haven’t ridden it for a while. It’s simple – every time you ride you just have to remember your ABC. C. And lastly, your Chain – you need to keep your chain well oiled. Schools with Bikes in Schools projects, or similar, have found these biking-related teaching resources beneficial to support their projects. ACC and the NZ Transport Agency’s have developed some BikeReady curriculum resources (written by Pam Hook) for schools which are directly aligned to the New Zealand Curriculum achievement objectives. Greater Wellington Regional Council and Enviroschools (Te Upoko o te Ika a Maui) have developed an Active Travel Action curriculum resource that proves a process for schools to implement sustainable active transport practices through student inquiry. Greater Wellington Regional Council has also produced this handy Bikes in Schools; Schools Guide which is available for all schools.